A marked presence of several small and medium enterprises (SME) renders the competitive landscape in the global homeopathy product market moderately fragmented, finds Transparency Market Research (TMR). In 2015, the leading five players could only account for mere 27.0% share of the global market pointing toward the fragmentation in the market. Of these players, around 17.3% share in the global marked was earned by Boiron, a globally prominent manufacturer, which had a large impact on the contours of the competitive dynamics. The company could boast of prominent position in the global market underpinned by its capacities in key regions such as the Middle East and Africa (MEA), North America, Europe, and Asia Pacific, notes TMR. TMR analysts also observed that a number of top players are focusing on geographic expansion across Asia Pacific and the Middle East and Africa to consolidate their positions. Several players are also planning to tap into the lucrativeness of e-commerce marketplace in a move to gain a competitive edge over their competitors. 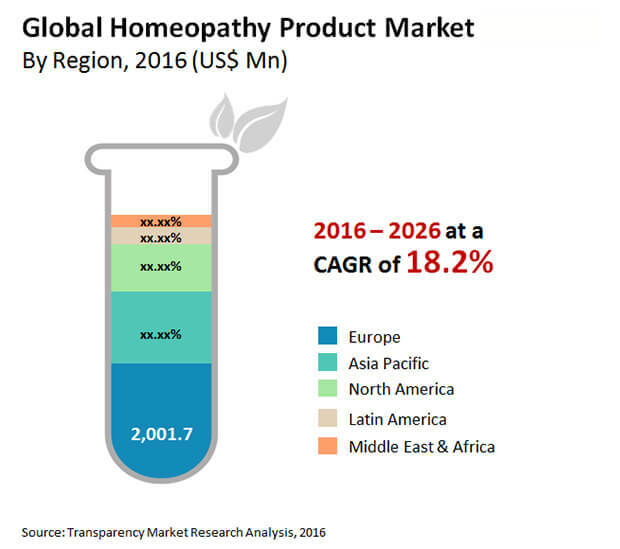 The global homeopathy product market stood at US$3.8 billion in 2015 and is projected to proliferate at a CAGR of 18.2% during 2016–2024. By the end of the forecast period, the market will earn a revenue worth of US$17.4 billion. The various forms of homeopathic products are tablets, tinctures, dilutions, ointments, and biochemics. Of these, dilutions form the most lucrative segment and is expected to reach a worth of US$6,253.9 million by 2024 end by rising at a rapid pace. The growth can be attributed by substantially rising demand for a convenient dosage form among the patient population. Geographically, the global market is led by Europe which is expected to hold its sway throughout the assessment period. However, the Middle East and Africa market for homeopathy products is anticipated to rise at a potentially attractive CAGR of 21.1% during 2016–2024. The growth is underpinned by the vast rise in disposable incomes. The mounting concern of side effects or adverse effects arising out of prolonged usage of allopathic medicines among patients and the rising awareness of the effectiveness of alternate medical systems are key factors that have led to the proliferating demand for homeopathy products all over the world. Homeopathy products have gained immense popularity in recent years owing to growing acceptance of this highly individualized remedy to address specific symptoms in patient populations, world over. A growing volume of population showing inclination toward alternate medical systems for the treatment of chronic ailments is a crucial trend accentuating the demand for homeopathy products. The burgeoning demand is supported largely by the rising confidence in the efficacy of homeopathy products and the growing disposable incomes especially in emerging economies. Populations in developed nations are witnessed making sizeable spending on the purchasing of homeopathic products. This has presented abundant opportunities for manufacturers to capitalize on. The rising prevalence of chronic diseases has led to the rise in demand for various products in complementary health practices. This is reflecting well on the demand for homeopathy products that are considered to have negligible side-effects. The global homeopathy product market may face few critical stumbling blocks. The lack of quality control and standardization of homeopathic medicine is the most glaring constraint hindering the uptake of homeopathy products among the global populations. This can be attributed largely to the infeasibility of various small- and medium-scale manufacturers in the market spread across key regions to conform to good manufacturing practices. This sometimes takes a serious toll on the product quality. Furthermore, the paucity of a robust, widely acceptable mechanism for global regulators to access the efficacy and safety of homeopathy remedies is also a crucial impediment to the growth of the market. Nevertheless, the market is expected to reap lucrative gains from robust promotional and marketing activities in the coming years, especially in developing regions. The rapidly rising online demand homeopathic products, coupled with intense competition among manufacturers to improve their product quality, is expanding the market prospects. The study presented here is based on a report by Transparency Market Research (TMR) titled “Homeopathy Product Market (Product Type - Tincture, Dilutions, Biochemics, Ointments, and Tablets; Application - Analgesic and Antipyretic, Respiratory, Neurology, Immunology, Gastroenterology, and Dermatology; Source - Plants, Animals, and Minerals) - Global Industry Analysis, Size, Share, Growth, Trends, and Forecast 2016–2024”.